CP/MISC/ETU. This series comprises verbatim transcripts of High Court case brought by John Thomas Byrne and Frank Chapple against Frank Foulkes and other Communist Party members re alleged ballot-rigging in the Electrical Trades Union (ETU) elections. 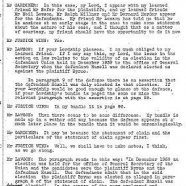 The trial began on the 17th of April 1961, with the judgement delivered on the 28th of June. Additional related material can be found in papers of the Industrial Department of the CPGB described in Kevin Morgan's introduction. 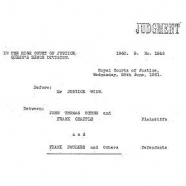 The series comprises three boxes of typescripts of the thirty-eight days of court proceedings spent in court between mid-April until the judgement was returned at the end of June.